Nearly 1,500 retailers, customers and employees of bag and accessory-maker Vera Bradley are at the Westin Hotel uptown, for a hybrid trade show, retail symposium and customer appreciation event. Indiana-based Vera Bradley has been holding these semi-annual events to boost sales by connecting with customers and retailers for about four years. This is the first time they've had their show in Charlotte. The company, which had $366 million in sales last year, has 42 corporate stores (including one at SouthPark), but sells much of its goods through more than 3,000 retailers. Friday's events in the Westin's ballroom and conference room offered a glimpse at hands-on, wholesale retailing. Sales reps plied the floor, which was full of Vera Bradley merchandise and complete with mock stores showing the retailer's suggested fixtures and merchandise layouts, as merchants placed their orders for the upcoming seasons. The whole set-up, complete with a stage with retractable doors leading to more merchandise, was trucked in for the show. Everything, from the handbags to the merchandise shelves, was on sale for the 1,000 or so retailers to buy for their shops. The company also hosted workshops for retailers covering topics such as the finer points of Vera Bradley's new luggage to integrating social media into one's business. The event is to be capped off Saturday with a customer appreciation shopping and activity day for 300 Vera Bradley fans who paid $99 for the experience. Company co-founder Patricia Miller called the event "retail business 101" and said it's helped spur sales through in-person interaction. 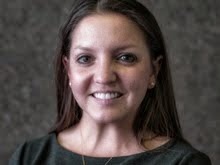 "In this world, where everyone is connecting by technology," Miller said, "We still think face-to-face interaction is important." Harris Teeter plans to demolish and rebuild its store at Central Avenue and The Plaza, replacing the aging building with a snazzy new design featuring a second story and a green roof. 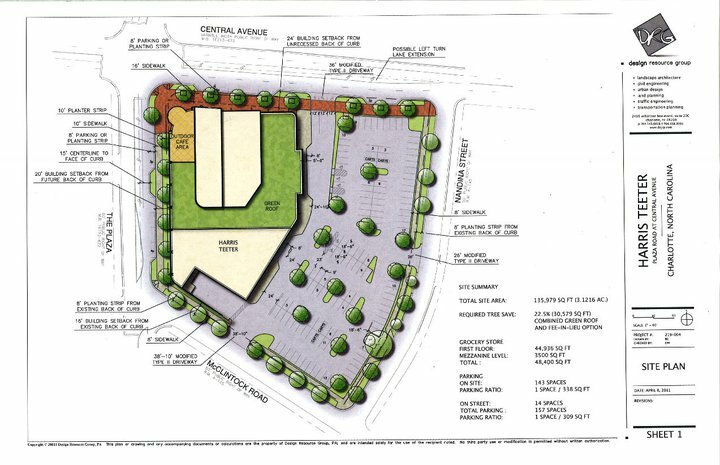 A spokeswoman for Harris Teeter said plans to put a "signature building" at that location have been in the works for some time. 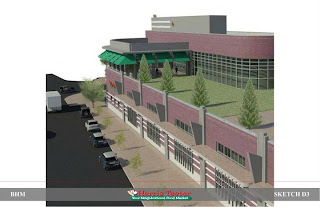 The proposal, first shown on the Plaza Midwood Neighborhood Association's Facebook page, calls for the existing store to be demolished in mid-2012 and the new store to open in 2013. 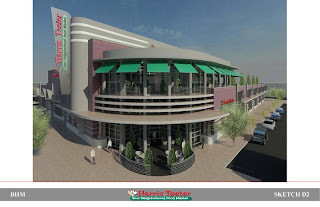 It's the second older, smaller store in Charlotte this year that Harris Teeter has proposed razing and replacing with an upscale building. The other Charlotte store the retailer plans to replace is in Myers Park. The Central Avenue location was opened by W.T. Harris, one of the chain's co-founders, in 1938. The retailer says that it was the city's first air-conditioned grocery store and first store open until 9 p.m. on Friday nights - major selling points at the time. But now, spokeswoman Jennifer Thompson said, the store is relatively small, and unable to carry the full line of items available at other Harris Teeters. The retailer operates some 200 supermarkets, mainly in the Southeast. The proposed 48,400-square-foot store, which will require zoning approval, is shown with a 143-space parking lot and a green roof covering part of the structure. Such roofs feature vegetation to cut down on energy costs and storm runoff. The proposed design also features a second-story mezzanine level with indoor and outdoor seating for shoppers. 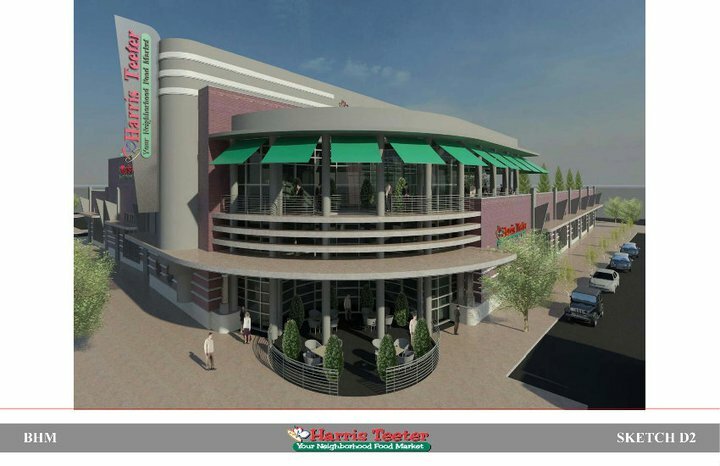 In a nod to pedestrian-friendliness, Harris Teeter says the new store will have a sidewalk entrance at the corner of Central Avenue and The Plaza, and a rear entrance facing the parking lot for drivers. Avenue," said Thompson in a statement. Nicole Storey, Plaza Midwood Neighborhood Association's president, said the plans were presented Tuesday night at the group's board meeting. "We're thrilled," Storey said. "Our store is definitely in need of replacement." 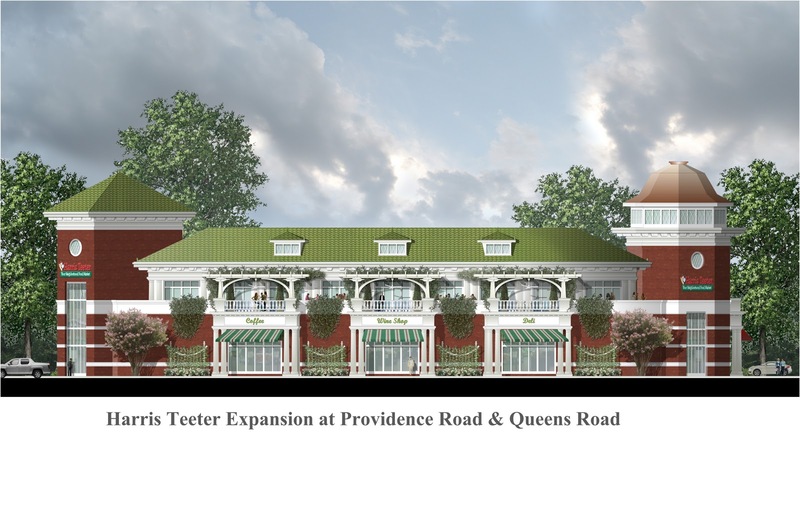 Harris Teeter has discussed replacing the building with neighborhood leaders for 10 years, Storey said. "What they've presented is really unique," Storey said. "I don't think any of us expected to see an art-deco store." The store's design bears some resemblance to another Harris Teeter redesign slated for Myers Park. 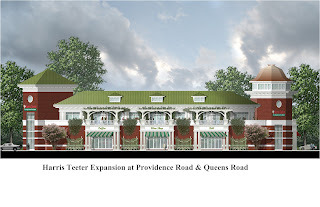 The Harris Teeter Express at the corner of Providence and Queens roads - which was also built in 1938 - will be replaced with a two-story, 42,000-square-foot Harris Teeter. But the exterior style is different, and fits the surrounding neighborhood well, Storey said. "They were talking about the new store and saying how unique it was, and I asked them to show us the Myers Park store," Storey said. "When they showed it to us, there were gasps in the room at how different it was." Men, watch out if you're thinking of buying something at Belk on Thursday night - it's Girl's Night Out at the SouthPark and Carolina Place stores. The department stores will be offering catered food and beverages and music from guest DJs while women shop. Customers will also get the chance to register for prize giveaways and, most importantly, 20 percent off full-price and discounted items. Belk says "very limited exclusions" will apply. The event is set to run from 5 to 8:30 p.m.
Belk has been rebounding from the recession, with higher sales and a return to profitability. The retailer is also in the midst of a multi-million dollar effort to rebrand itself, trying to draw in customers with a new logo and updated, modern image. Belk is also spending millions of dollars to modernize its technology systems. The owner of Reid's Fine Foods, an upscale grocery store that left its uptown location last year, said the store is reopening Tuesday at the Selwyn Corners shopping center. And a private equity firm announced it has bought Charlotte-based Firebirds, a Colorado-inspired chain of wood-fired grills. Reid's closed last year after its former owner claimed the economy was hurting sales. The old 13,500-square-foot store at the Seventh Street Station is scheduled to open in July as a food market with around 30 vendors. The new Reid's, owned by Tom Coker, will be near Selwyn Avenue and Colony Road. The store will have specialty foods, including a butcher shop, deli and bakery, and will also offer gifts, fine wines and cooking classes. In restaurant news, Firebirds has been sold to Angelo, Gordon & Co, a New York-based private equity firm that manages over $24 billion. Firebirds, which was founded in 2000, operates three Charlotte restaurants and 15 other locations from Alabama to Delaware. Angelo Gordon said that Firebirds co-founders Dennis Thompson and Doug Glendenning will stay on as directors and shareholders of the company, and Mark Eason will remain Firebirds CEO. The deal's terms were not disclosed, but Angelo Gordon said it's private equity arm focuses on investments ranging from $50 to $500 million. "Firebirds has all the hallmarks of a great restaurant company and is comparable to the best I’ve worked with over the past 15 years as a restaurant investor," said Angelo Gordon managing director Richard Leonard, in a statement. "They’ve built a great company and we think Firebirds will be successful across a wide range of geographies and markets. Our plan is to help the company grow significantly by adding locations over the next several years." BBB warns of roofing scammers - have you been targeted? After recent hailstorms and thunderstorms, Charlotte's Better Business Bureau issued a warning to local homeowners: Watch out for unscrupulous roof contractors, some of whom are from out of town, angling for repairs. We've heard about contractors going door-to-door in some Charlotte neighborhoods and offering estimates for roof damage. According to the BBB, while many of these companies might be legitimate, others are likely storm chasers offering shoddy work at cut-rate prices. And they may have a lot of roofs to work on. One Observer employee said a roof contractor at his house said he believes there are as many as 250,000 damaged roofs in the county (of course, he has a vested interest). Do not permit work to start without a signed, written contract that includes start and completion dates, exact costs, specific work to be done, and warranty information. Have you seen or been contacted by a roofing contractor? I'd like to hear about it. Call me at 704-358-5041 or email me at elyportillo@charlotteobserver.com. Wilson Smith, one of the three men who founded the Food Town chain that would grow into Food Lion, died Wednesday morning, according to local media in Salisbury. He was 93. Along with brothers Ralph and Brown Ketner, Smith helped found the first Food Town in Salisbury in 1957. The three solicited $10-a-share investments from their friends and families to get the business off the ground. The company chugged along as a neighborhood grocery store, until Ralph Ketner decided to try what was, at the time, a new retail strategy: slash prices on everything and try to move heavy volume quickly. The store began growing, and the co-founders changed the name to Food Lion. When Smith retired from the company as vice president in 1979, Food Lion had about 100 stores. Since then, under the ownership of Belgian mega-grocer Delhaize Group, Food Lion has grown to about 1,300 stores. Brown Ketner died in the early 1990s, shortly after Ralph Ketner, who is still alive and lives in Salisbury, retired from the chain. If you're looking for a tree to plant this Earth Day but can't bring yourself to pay for one, try Lowe's. The Mooresville-based home improvement retailer will be handing out a million saplings this Saturday at its stores around the country. The trees are being given away in partnership with conservation group American Forests. Lowe's says the types of tree at each of the company's 1,725 stores have been selected to thrive in the local environment. They'll be free while supplies last. And in a nod to the growing role played by social media and mobile technology in retail, you'll have a couple of different ways to learn about your saplings once you bring them home. Each tree bag will have a bar code, Lowe's says, that you can scan with your smartphone. That code will take you to a page of tree facts and a video for how to take care of your sapling. And Lowe's is inviting customers to share their tree stories on LowesCreativeIdeas.com. If you want to learn more, visit Lowes.com/earthday. What do you think of Lowe's promotion? Look out for more localized daily deals in Charlotte, with LivingSocial rolling out more "hyperlocalization" to offer half-off deals at local restaurants, spas, and retail outlets to people who sign up for its contact lists. The site is similar to Groupon and a host of other daily deal sites that make their money by offering steep discounts in partnership with local merchants. The market for such deals, fueled by the Internet and merchants' desire to draw in new customers during the recession, has exploded into a lucrative, multi-billion dollar affair over the past two years. Here's how it works: Customers sign up, and the websites alert them to new deals each day. They can buy a coupon for the deal, which usually costs 50 percent or less of the good's face value, and then redeem the coupon with the local merchant. The daily deal company takes a cut of the sale, giving the rest to the merchant. LivingSocial said Charlotte is one of six markets the company is expanding in, effective Thursday. Although the site has offered deals in Charlotte for some time, LivingSocial said they'll now have more tightly-targeted deals. "LivingSocial has offered deals in the Charlotte area previously. However, we've found there are certain markets that warrant hyperlocalization," said spokeswoman Maire Griffin, "Meaning deals that are even more focused on neighborhoods. All of our members can manage their subscriptions to receive both Charlotte lists or focus on just one if that fits their life the best,"
The Washington, D.C.-based website recently raised $400 million from investors to fuel its expansion. The company expects more than $1 billion in revenue this year. Groupon has also been growing rapidly. The company recently completed a $950 million round of financing, and has had discussions with banks about going public with the company valued at $25 billion, according to media reports (like this one). To put that in perspective, Google was valued at "only" $23 billion when it went public in 2004. Some merchants (like this one) have criticized the daily deal sites for taking too big of a cut, requiring businesses to spend more than they're prepared to on discounts and training customers to shop only for dramatic discounts. But with the daily deal fervor showing no signs of ending anytime soon, such sites seem likely to remain a permanent part of the local retail landscape in one form or another. Charlotte's frozen yogurt scene is still booming, with a new self-serve location opening soon in Dilworth. Two local frozen yogurt newbies, Tara Hubara and Erik Giles, are behind the new Menchie's franchise at Kenilworth Avenue and East Boulevard. The colorful shop will be North Carolina's first Menchie's, adding to a slew of fro-yo joints that have opened here in the past several years, including Tasty-Yo, Pinkberry, TCBY, The Frozen Isle and Yoforia. "There has certainly been a rebirth of frozen yogurt," said Hubara, whose day job is doing human resources work at her husband's appliance company. She thinks that there's still room in the marketplace, and that Menchie's unique features - a party room, a patio, a fireplace and even a mascot - will set it apart. Before Menchie's, her work experience had "nothing to do with frozen yogurt whatsoever." She met Giles, who owns a computer consulting company in Charlotte, when they both independently approached Menchie's about opening a franchise. For now, they'll keep their day jobs as they get the business off the ground. Giles said he still enjoys his consulting business, but was looking to do something "that gives people smiles on their faces more than IT." And his kids go nuts for self-serve frozen yogurt, so Giles figured that would be a business that would allow him to spend quality time with them. The store is still being outfitted, although the colorful name and logo are in place out front. They're planning a soft opening for friends and family sometime next week. A grand opening will follow soon after, but the date hasn't been set. A charity gala and fashion show scheduled for Thursday will feature Charlotte boutiques and business, with proceeds donated to the fight against cancer. Fashion for Life, part of STYLE Week Charlotte, will be held in the lobby of the Belk Theater on North Tryon Street uptown. Several Charlotte boutiques will showcase their wares, said spokeswoman Meredith Holt. Child models who have battled life-threatening illnesses will be outfitted in clothes from Peek-a-Boo Couture Boutique, and the grown-ups will wear designs from Elle VJ and The Pink Hanger. The event is being hosted by Sasha's Spa, a mobile-spa service. Tickets are $35 each and include light food and two drinks. All proceeds go to the Leukemia & Lymphoma Society. Whole Foods, the organic and natural grocery store that's tantalized Charlotte since plans to open here were first announced in 2004, will finally break ground near SouthPark mall on Monday afternoon. The grocer plans to open a 42,000-square-foot store at Fairview and Sharon roads next spring, in the mixed-use Ashley Park development. That's diagonally across from SouthPark mall and near Phillips Place. Today's 3 p.m. groundbreaking ceremony marks the start of construction, and will be attended by Mayor Anthony Foxx. Whole Foods originally planned to open a store in the Elizabeth neighborhood and a second store in SouthPark by 2009. But those plans were delayed, and the stores never materialized. The new store - Whole Foods' eighth in North Carolina - will be entering a crowded food market, near the Morrocroft Harris Teeter and organic grocery Earth Fare. But Whole Foods has a devoted fan base, including some Charlotteans who stock up on Whole Foods goods when they're in a city that has one. Employees at Belk's flagship SouthPark store have helped lead a drive to raise $10,000 to fund a summer school program at a nearby elementary school. Randy Dell, the store's manager, said he will present Montclaire Elementary, off Archdale Drive, with a check Thursday to help run a CDF Freedom School there this summer. The program works to help underprivileged students develop a love of reading and other academic skills. Dell said the money was raised by store employees and a private donor. He hopes that the Belk store, along with other nearby businesses, can "adopt" the school, consistently supporting its students. Their next effort will be collecting 100 backpacks to donate to students there. "The energy, the way they're enthralled with their students and getting them to learn more, is so impressive," Dell said of the school's staff. The Belk Foundation, the store's founding family's charitable arm, also supports the Freedom Schools. Shopping online for groceries could get cheaper at Matthews-based Harris Teeter - if you do it often enough. The grocer is rolling out a flat-rate option, in which customers can pay $16.95 a month to use Express Lane online shopping instead of $4.95 each time. The service lets shoppers order their groceries online and pick them up curbside at the designated store. The $16.95 fee will cover unlimited online grocery shopping, and shoppers will have the option of renewing their flat fee every 30 days. You'd have to use Express Lane at least four times a month to save money with the service. Express Lane is available at 68 of Harris Teeter's 200 stores - including most in the Charlotte area - and the grocer plans to add it to 20 more within a year. U.S. Senator Kay Hagan, an N.C. Democrat, weighed in Tuesday on the death of Jack Fulk, who co-founded Bojangles' in Charlotte. "With its beginnings in Charlotte, Jack Fulk's vision for a restaurant with spicy fried chicken and homemade biscuits became a North Carolina institution," Hagan said in a statement. Fulk, 78, opened the first Bojangles' in 1977 at South Tryon Street and West Boulevard. He popularized the Cajun-spiced chicken and made-from-scratch biscuits, and continued to operate a Bojangles' franchise after retiring from the company. "His innovative idea spread to 11 other states, and on Friday, my DC office greatly enjoyed a Bojangles' biscuit breakfast with some of Representative Watt's staff," Hagan said. "My thoughts and prayers, along with all of us who are dedicated Bojangles' customers, are with Jack's family and friends." Elsewhere in Charlotte, a new daycare option for dogs is set to open this weekend at 1719 Montford Drive, near Park Road (corrected). The Barker Lounge will host a grand opening Saturday, April 9, between 11 a.m. and 4 p.m., with giveaways, drawings and discounts for daycare and boarding packages. Charlotte's Barker Lounge is the company's fifth franchise location. The 9,000-square-foot daycare is in a building formerly occupied by Space Savers, a home goods and organization store. Doggie daycare rates start at $28 dollars a day, but you can save money by buying packages of up to 100 days.